Four films by acclaimed German director Rainer Werner Fassbinder. In Veronika Voss (1982), a journalist (Hilmar Thate) becomes fascinated with Veronika Voss (Rosel Zech), 1940s German film star and one-time friend to Goebbels, who has deteriorated into a morphine addict in the care of a disreputable doctor. 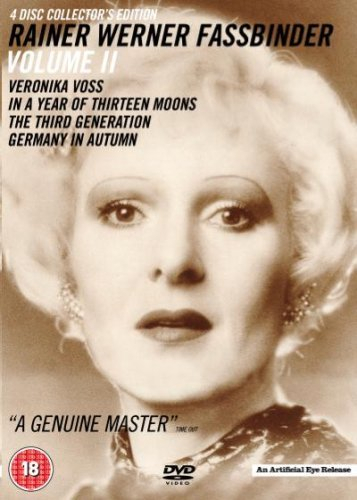 In In a Year of Thirteen Moons (1978), Volker Spengler gives an extraordinary performance as the transgendered Elvira, a man who has become a woman in a desperate bid to please a former lover. Relaying various episodes from Elvira's life, Fassbinder's powerful film is also one of his most intensely personal. The Third Generation (1979), one of Fassbinder's most controversial films, is a perverse satire about an incompetent gang of bourgeois terrorists who are motivated more by a desire for action than by their weak political convictions. Germany in Autumn (1978) is a portrayal of the political unrest wrought in the autumn of 1977 by the activities of the Red Army Faction. Through documentary, dramatised vignettes and archival footage, Fassbinder and his collaborators examine the events and explore the motivations behind this crisis point in German history.